Father's Day is supposed to be all about dad, and yet, every year when I ask my husband how he wants to mark the occasion, he replies, "Whatever you want, honey." Agreeable, sure, but helpful? Nope. So this year I decided to turn to the experts for advice: all the other dads I know. I gave them two rules for their Father's Day wish lists—keep it PG and include the whole family. The result was an eclectic list of fantastic (and many FREE) ways to celebrate Father's Day in New York City that both parents and kids can enjoy. Even better, many of these ideas aren't unique to this Sunday—you can try most of them anytime. So whether you're a partner left to plan the big day or a father looking for inspiration, here are 10 things real-life dads would love to do on Father's Day in NYC. 1. Get revved up with slot cars and go-karts. It may be cliche to say dads like all things car-related, but the fathers I talked to confirmed it. Dad Noah raved about Buzz-a-Rama, an old-school slot-car racing joint in Brooklyn that's been around since 1965! He's been many times with his young son, but take note: it's imperative to call ahead since it's often closed for private parties. Many dads also professed their love of go-karting, and you can do that at Staten Island Go Karts, which also has mini golf and batting cages. If you're up for a day trip, Pole Position Raceway offers indoor go-karting in Jersey City and on Long Island. 2. Take him out to a ballgame. Dad Stanley favors baseball, and while the Mets are away, the Yankees have a home game on Father's Day. But to save money and enjoy a more intimate experience, consider the NYC minor league Subway Series between the Staten Island Yankees and the Brooklyn Cyclones, which takes place on Sunday, June 21 at the Richmond County Bank Ballpark on the isle. And if you prefer something old-fashioned, head to the Bronx's Bartow-Pell Mansion Museum for a vintage baseball game circa 1864! 3. Catch a no-cost concert. A few dads mentioned how much they love sharing the experience of live music with their kids. Luckily this year, Father's Day happens to coincide with the annual Make Music New York festival. From morning to night, hundreds of FREE concerts take place in public spaces like parks and plazas throughout the five boroughs. The schedule is up and many genres are represented, including great family concerts like Laurie Berkner headlining a SummerStage Family Day in Brooklyn. Got teens into harder stuff? There's also the day-long Punk Island music fest on Staten Island and the Bang on a Can Marathon in the Winter Garden at Brookfield Place, both FREE on Father's Day. 4. Enjoy a taste of old New York. Longtime New Yorkers, especially those of us who were raised here, love showing our kids old NYC holdouts, especially the legendary restaurants we grew up with. Dad Peter said he wants to hit an iconic spot like Katz's Deli or Sammy's Romanian Steakhouse. Sound too exotic for your brood? Hit an authentic old-school soda fountain for malteds, egg creams or ice cream sundaes. 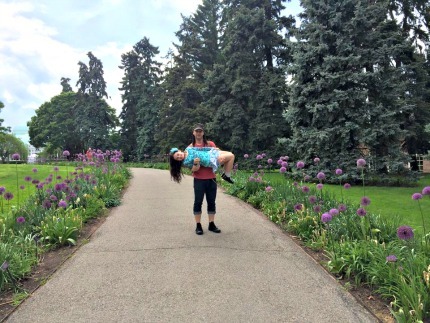 The New York Botanical Garden is a great destination for Father's Day or any day! 5. Explore one of NYC's botanical gardens. You've probably visited the New York Botanical Garden, currently home to an amazing Frida Kahlo exhibit, and the Brooklyn Botanic Garden, which just opened its expanded Discovery Garden, but did you know there are three more botanic gardens in NYC? Yup: the Queens Botanical Garden, which is hosting its annual activity-filled Summer Solstice celebration on Father's Day, as well as Brooklyn's Narrows Botanical Gardens and Staten Island's Snug Harbor. Brooklyn dad Kevin recalled spending a lovely Father's Day at Snug Harbor with his family, after which they hit his favorite pizza place, Denino's (and since the restaurant has been around since 1937, it counts as an old New York outing, too). 6. Hit an amusement park. Although you need to leave NYC to find the huge ones, there are a handful of fun amusement parks right here in the city, and most are small enough that you can do all of the rides in one day. So why not Father's Day? If you're worried Coney Island's Luna Park and Deno's Wonder Wheel are going to be a madhouse, local dad Michael suggested Brooklyn's other oceanside amusement park, Adventurer’s Family Entertainment Center, on Shore Parkway. Got preschoolers? Your best bets are Central Park's Victorian Gardens, Queens' Fantasy Forest in Flushing Meadows Corona Park or Staten Island's Fantasy Shore at Midland Beach. 7. Play miniature golf. Amusement park-loving dad Michael also suggested a round of mini golf at Tribeca's Pier 25. NYC is actually home to 11 mini-golf courses, including a FREE one on Governors Island. Prefer grown-up golf? Try the Bronx's Turtle Cove Golf Center or hit Chelsea Piers for its Fathers’ Day Golf Club Special: dads receive a complimentary $25 Ball Card when their partner or child purchases any Ball Card on Sunday, June 21. 8. Grab BBQ and beer. A few years ago, we rounded up our favorite family-friendly barbecue joints in NYC. All are still open, and according to the dads I talked to, BBQ is as beloved by them as ever. Dad Marc said he likes to take his teen son for barbecue at Beast of Bourbon since there's live rock music, too. Family-friendly beer gardens such as Bohemian Hall in Astoria and DSK Brooklyn are also great options for Father's Day meals that should please kids and adults alike. 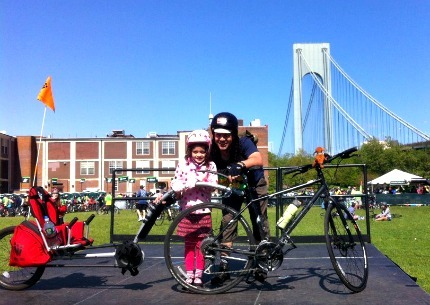 My husband and daughter cycle all over NYC together; here they are on Staten Island. 9. Go biking. Multiple dads said they wanted to spend Father's Day cycling with their families. Luckily, there are lots of kid-friendly bike routes throughout NYC, and you can even cycle car-free on Governors Island. Want to get into the competitive spirit? The annual Harlem Skyscraper Cycling Classic takes place in Marcus Garvey Park on Father's Day and includes races for adults and kids. 10. Take a day trip. A lot of the dads I talked to suggested outings that aren't in NYC. However, many are nearby and make for easy Father's Day getaways. New Jersey's construction-themed amusement park Diggerland, Sahara Sam's Oasis and other indoor and outdoor water parks, strawberry picking, the challenging Adventure Park at Long Island, Westchester's music and eco-activity-filled Clearwater Festival, hiking in Hudson Valley and horse racing at Belmont Park were all top dad picks. You can also find more getaway inspiration in our NYC Day Trips Guide. None of these ideas work for you? Then check out our Event Calendar and Summer Fun Guide for additional Father's Day ideas.